Every culture has its own version of social envy, the “green-eyed monster” that keeps people striving for things they don’t really need because those things are perceived as status symbols. There’s nothing wrong with healthy competition in sports or the marketplace, or with healthy comparisons we make for purposes of learning. What is unhealthy is when competition and comparison turn into judgment that diminishes self and others. In the extreme, comparanoia can lead to widespread economic ruin. “Living above one’s means” is rampant based on credit card usage. Many financial institutions and other traditionally reliable industries have failed in part due to competitive greed. It is more important than ever to help people learn to be co-creators of prosperity and abundance rather than to look over their shoulders to see who can outrun whom. The original meaning of the verb “to compete” is “competere,” which means “to strive together.” If we could see those around us as co-creators in our growth, gravitating toward them and learning that another’s star quality doesn’t dim our own brightness, we might learn that we can all shine more brilliantly. 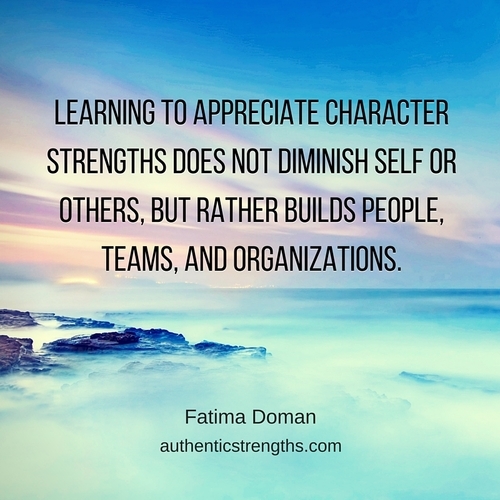 Learning to appreciate character strengths does not diminish self or others, but rather builds people, teams, and organizations.